Thank-you to Eva Goodwin who commented on Ferguson: Geoff's response. This wise lady reminded me there is a difference between "pigeon-holing and seeking niche advice." In my own household, Mr. Myrt is listening for Union Civil War info, while Ol' Myrt here thrives on learning new technology and how it may enhance family communications. Those are simply our chosen focus topics of late. Eva also broaches the subject of "unintentional bias" when it comes to conference speaker selection. She writes "We go to lectures and webinars on methodology led by Warren Bittner even if we don't have German ancestry and even though his case studies largely are in German and German-American records. So why wouldn't it make sense to have a prominent POC [Person of Color] genealogist lead such a course?" She continues "As someone who isn't behind the scenes in any of these events, I can't speak to what's going on that this isn't happening. But I do think that unintentional bias must play a huge role in it. 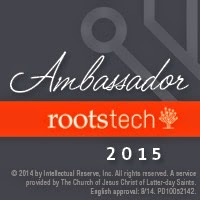 When those in a perceived "inner circle" of genealogists continue to (again, unintentionally, I'm sure) see POC genealogists as POC genealogists instead of expert genealogists who specialize in POC records, then there is unintentional exclusion happening, whether or not those genealogists are submitting proposals etc." Ol' Myrt here keeps thinking back to the phrase "unintentional bias." I'm aware of a little "unintentional bias" somewhat akin to "presentism" where it's difficult to look at things globally, or beyond the confines of one's realm of experience. In the case of genealogy researchers, it's hard to avoid presentism when evaluating an 18th century will, unless one takes care to study the laws and cultural mores of the decedent's time period and locality so as to avoid incorporating 21st century definitions when forming conclusions. In my early days of genealogy research, Ol' Myrt here concluded one of her ancestors must have been highly religious because the beginning of his will read something like "being of sound mind, but weak in body, I hereby bequeath my soul to Almighty God..." In actuality, that phrase was the usual and customary boilerplate text for wills in colonial America. Individuals in a group of genealogists have obvious bias when it comes to seeking classes, courses and conferences that meet specific research goals. Mr. Myrt tends to judge a conference's value to attend if featured speakers include those with Swedish research expertise. While I applaud Mr. Myrt's heritage, I'm tending lately to look for Welsh records survey and research strategy classes. So both Mr. Myrt and I fall short when it comes to looking beyond our own research bias, which is also part of our cultural heritage. But Mr. Myrt and I aren't serving as national-level conference and program chairpersons. These folks must look at demographics of both previous conference attendees and those they wish to attract at the upcoming conferences hence Ol' Myrt's comments in Ferguson: Unintentional Bias - Call to Action for program chairs. Thinking deeper, people wishing to overcome "unintentional bias" must think through past actions and thought patterns to see where we must change how we think and act around others. This isn't about genealogy classes, it's about how we act with people. PERIOD. It took me a while, but I located the Golden Rule, 1961. Cover illustration for The Saturday Evening Post, April 1, 1961. 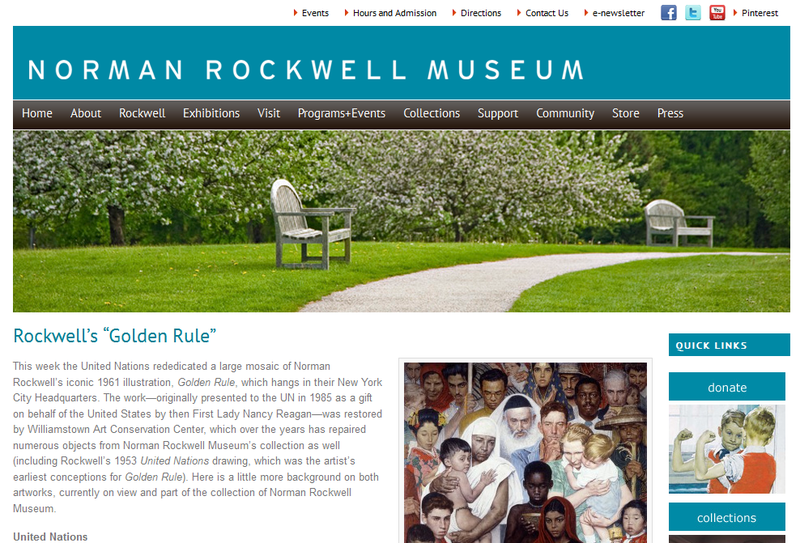 Norman Rockwell Museum Collections. ©SEPS: Curtis Publishing, Indianapolis, IN. A large mosaic of the same was originally a gift of Nancy Reagan to the United Nations. YES, it's really as simple as "Do unto others as you would have them do unto you." I give great thanks to *all* who have gotten this discussion going, and have carried it forward so well. I have been following the discussions avidly. And, I suspect that I also want to give thanks to all who have carried the important realities privately to many people who can make a difference, where possible. How much do we miss? What knowledge, what innovative approaches to inferential analysis, what obscure record references, do we not learn when we don't embrace *all* of the people who are doing great work. Too much! It makes no sense.... And we all lose. I sincerely wish that this moves things forward in a true way, and that the momentum continues to build and grow. Although it is a matter of 'fairness', it is so much more than that. *Not* openly welcoming everyone to the table is also just plain stupid. Thank-you for the potluck supper analogy. All 20 participants are left going hungry when only 6 bring a dish to share. I've becoming more aware of my own "unintentional bias" on deeper levels as this discussion has rolled out. But then I don't have to worry about the safety of my children and grandchildren. Though actually, I should mention that a murder took place tonight within a block of where my daughter Stacey and family as they volunteered at Salt Lake City's Road Home. At least among our family, friends, associates and neighbors we can conduct ourselves with all due kindness and consideration.